I was totally blank on what to post today. This happens when you either have too many choices or none. In my case, i was somewhere in the middle. I have one post in my drafts but wasn't sure will it fit under this theme, so i wanted to make something else, but was afraid of the sugar. Yes, my kids don't want to eat sweets, and it is only me and my hubby, forced to finish, sometimes it is only my hubby. Last week i made mango payasam twice, it was for a get together at home, so it got over in no time. I made a delicious mango tart for my kiddo's birthday and it too was a great hit with my friends. As usual, i didnt take any pics of the mango tart, ow have to wait for another gathering to make it, as i have been strictly warned by my better half, not to utter the word dessert! So with situation like this, what to make the for day 3?? Both the kids started a liking for peanut butter, so i made this quick mug cake with peanut butter for their evening snack. Needless to say, tummy happy, mummy also happy! The pictures are taken with my iphone, was in a hurry to serve them, will try to do again some other time. To this add water and oil and mix. 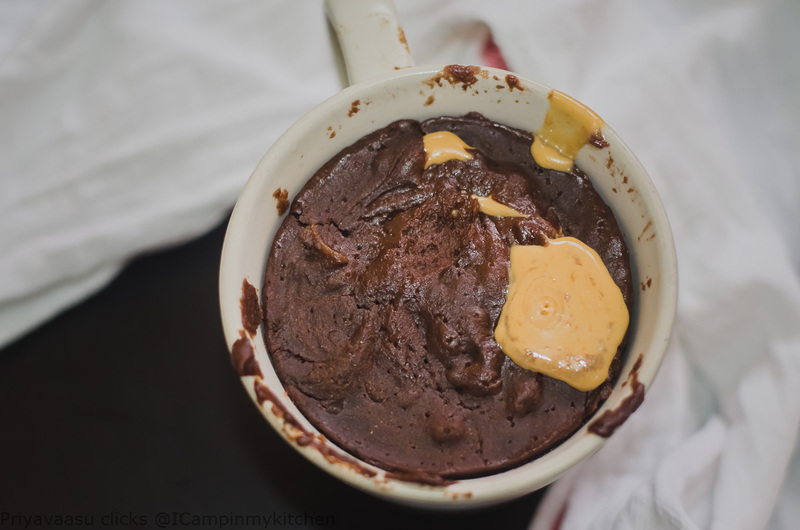 Now add half the cake mixture to a microwave safe mug, add peanut butter and top it with the remaining cake batter. But I like your idea of mug dessert , and a vegan version is more than welcome . I think you should take some few minutes off to click the pictures anyway priya...see how we are missing those payasams now...this one even with the phone, the clarity is great..and a mug cake is welcome anytime! My hubby too will say don't make sweet things and then will ask for something sweet! 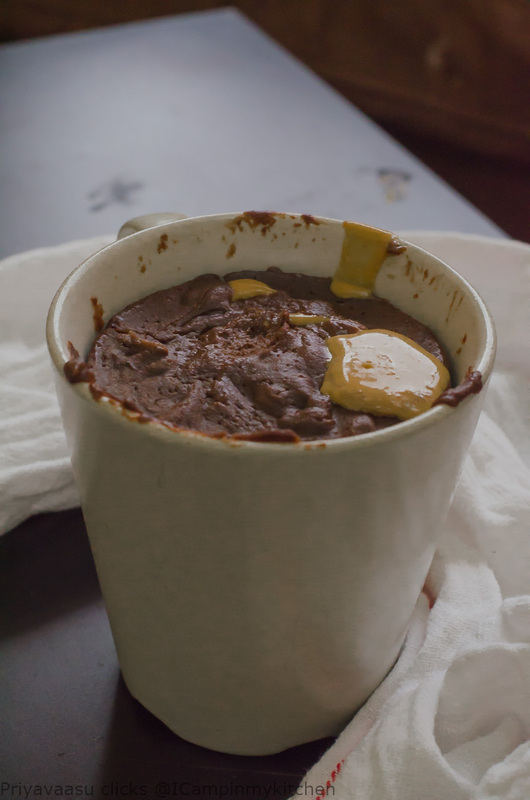 If he pesters me too much for something sweet then mug cakes are the best options. Love your peanut butter one... yummy. Just cant take my eyes from your mug cake, a real feast for chocolate and peanut butter lovers. That sounds like a great quick and easy dessert for those afternoon sweet cravings. its great to whip up this delicious treat in short time! Delicious may whip it for myself, 1/2 the quantity for myself tomorrow. Morning snack. Thanks Priya I am loving it.